Recently we decided to update the firmware of our non-EU FrSky Taranis X9D, so it will be fully compliant with European regulations. 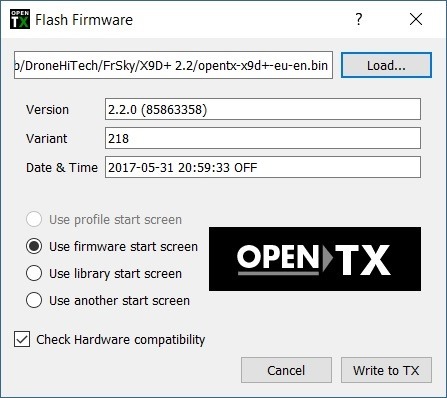 In this tutorial, we will explain the differences between the international and EU firmware as well as show you how to flash your Taranis with the latest firmware. The latest EU firmware for FrSky products is called EU LBT (Listen Before Talk). All FrSky products sold in the European Union should have this firmware installed. However, if you have purchased your transmitter or receiver from international websites like Banggood, Aliexpress or Gearbest, you probably have an international (non-EU) firmware version. Taranis with EU firmware does not support D8 mode. If you have EU firmware installed you cannot select this mode. And you will not be able to connect your Taranis with D-Series and V-series receivers, like D4R-II, D8R-II, V8R-II etc. The FrSky Taranis has two firmwares installed: the first one is the operating system of the transmitter, called OpenTX. The second firmware is the one of the internal RF module (XJT module). Updating only the OpenTX firmware to an EU version will simply remove the “D8 mode” from the selection menu. However if you don´t update the firmware of the internal XJT module it will still not work with EU-flashed receivers. If you want to update the Taranis firmware through your PC/Mac, you will need to download the OpenTX Companion software. Go to the OpenTX download page and get the latest version. 09.2017: Current version is OpenTX 2.2. Installation file for Windows can be directly downloaded from this link. Next, you will need to install the drivers for your FrSky Taranis. Power OFF your Taranis transmitter and connect it to your computer over the USB port. 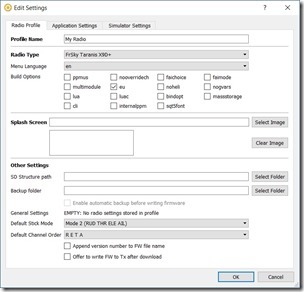 Download the Zadig tool and run it as Administrator. 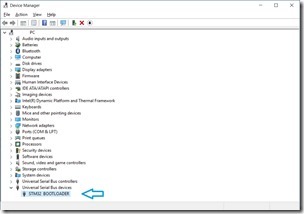 Choose “STM32 BOOTLOADER” from the drop-down menu and click on “Install/Replace Driver”. 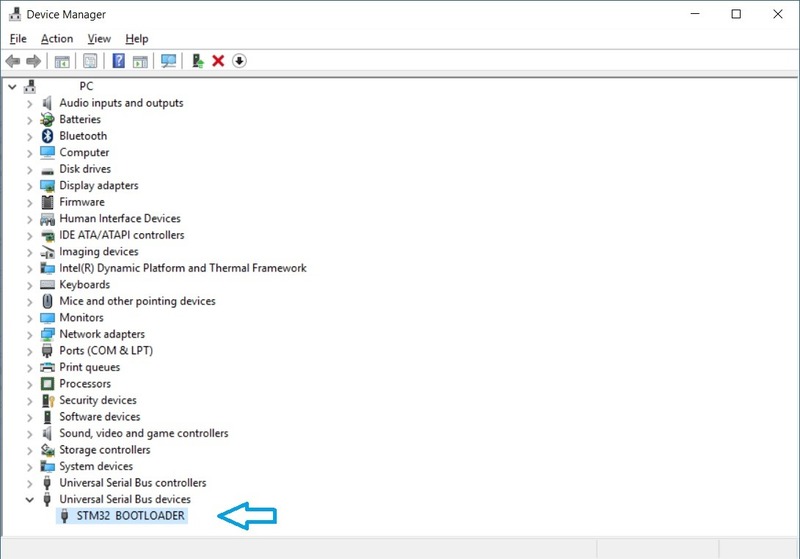 If everything went well, you should see the device in “Device Manager”. 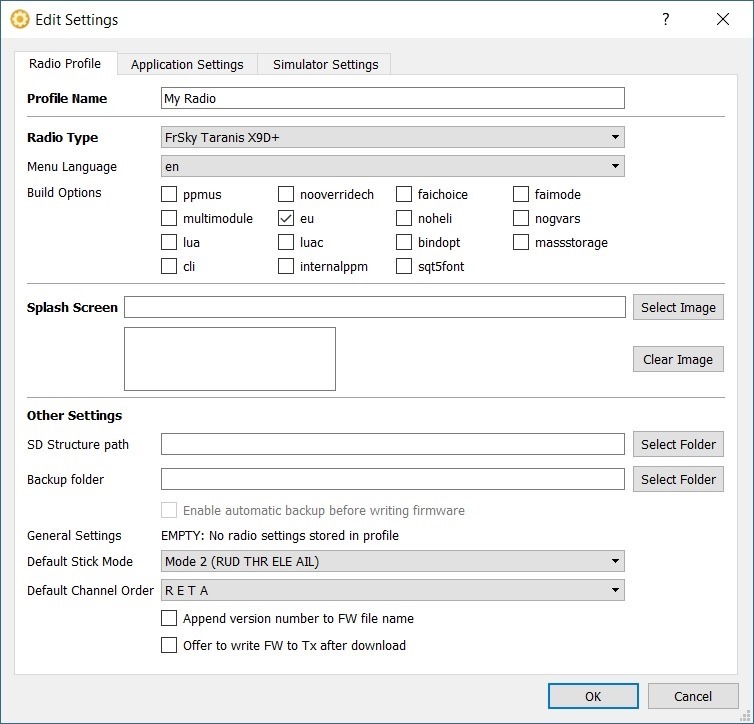 Start OpenTX Companion and go to settings and choose your radio type from the drop-down menu. 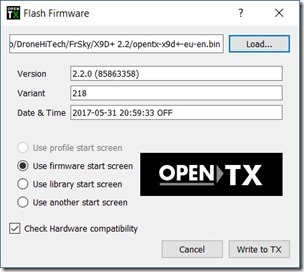 If you want to flash the EU version of the OpenTX firmware, select EU. Click on “File” menu and then “Download…”. Then download the newest available firmware. To update the firmware go to the “Read/Write” menu and click “Write firmware to Radio”. Load the firmware, which you have downloaded and then start the flashing process by clicking on “Write to TX”. Now your Taranis X9D operating system is updated and you can proceed with the flashing of the internal RF module. 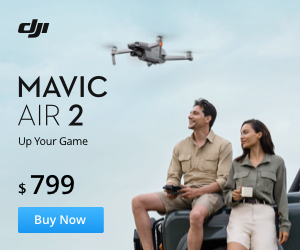 You can update the firmware of your Taranis Q X7 the same way as described above. Just select the model from the dropdown menu, download the corresponding firmware and install it. Go to the official FrSky webpage and download the latest firmware for the XJT module. To be compliant in the European Union, please download and install the XJT_LBT firmware version. 09.2017: Current XJT_LBT version is 151223 and can be downloaded directly here. Extract the firmware and copy the .frk to the SC card of your Taranis under the “FIRMWARES” folder. Insert the SC card back into your Taranis radio and power it ON. Long press the “Menu” button and navigate to Page 2. Go into the “FIRMWARES” folder, select the firmware and long press the “Enter” button. Select “Flash internal module” and press “Enter”. After that, the firmware of the internal XJT of the Taranis will be flashed/updated. 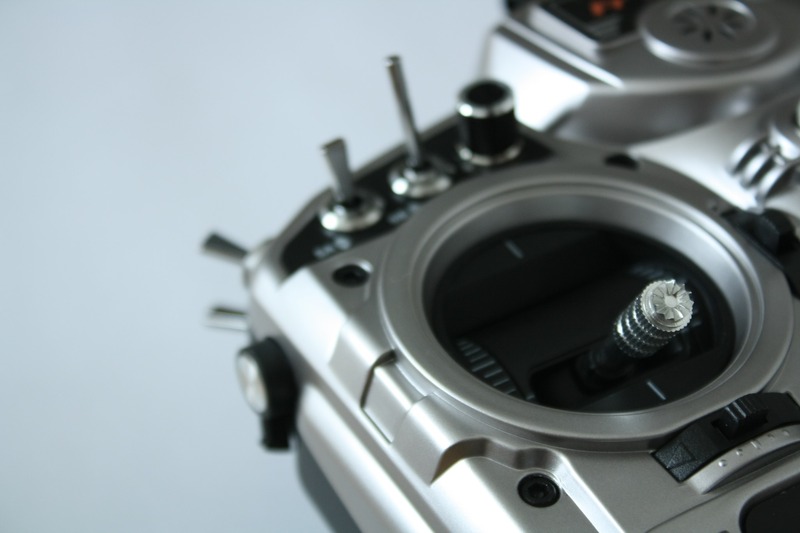 The Taranis Q X7 has the same XJT internal firmware as the Taranis X9D and can be flashed the same way. If you have successfully flashed your international Taranis with EU firmware, you are now compliant with the EU regulations. Please also note that your newly flashed radio is only compatible with X/LR series receivers EU version. Receivers with international firmware need to be also flashed with EU firmware. Thank you for reading the article! If you like it, share it with your drone interested friends. For more news and how-to´s follow us on Facebook and stay tuned!